One thing that is particularly poignant about this is that people are under the impression that they voted for Harper. Well, unless you lived in Calgary Southwest, you didn't have the opportunity. You may have voted for an MP belonging to Harper's party. And nobody is talking about taking away his or her vote in parliament. Obscenely rare is the time when everyone can get what they want, but this situation is as divisive and devoid of compromise as any. 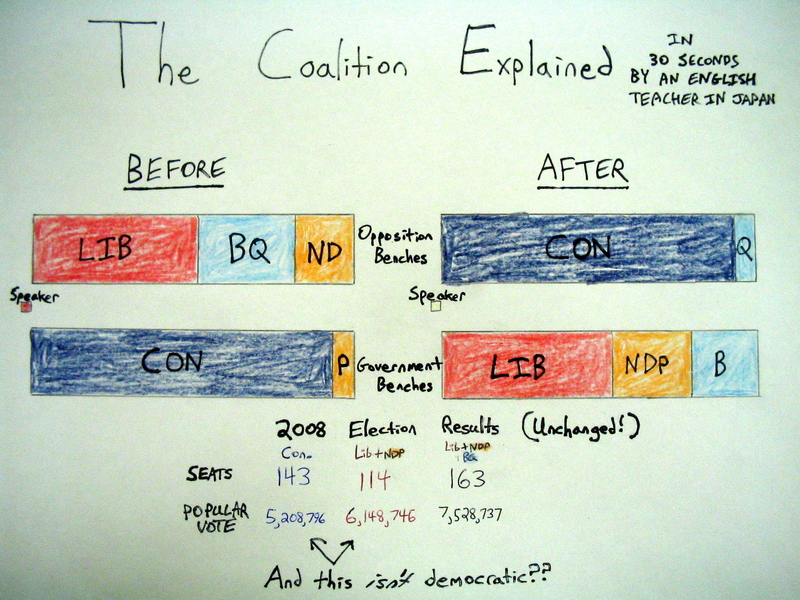 It clearly cries out for electoral reform and some kind of proportional representation. Also, in the far future, a non-partisan parliament would be nice. The territory of Nunavut and most Canadian cities are already non-partisan - should we spread this elsewhere? Electing a Prime Minister could be like electing a Speaker. These old-style politics, and the political system that goes with them, have run their course. We're in an era where a coxcomb from PEI can tap on a laptop in some small Japanese city and pretend to be an authority on political matters. Those who've installed a CMS on their web server can do so somewhat more convincingly. In any case, it doesn't take much effort to be informed and spread information! I suggest doing the same if you're interested. Blog! Thursday morning Harper will take his eight-vehicle motorcade about 300 feet across the road and ask you for permission to shut down Parliament until the end of January. This will be for the sole purpose of avoiding a confidence vote Monday night he knows he cannot win. In doing this, Harper – who inherited the mantle of the people-first, bottom-up Reform Party - will seek to silence every MP and every voter. He will be the first to ever do this, the ultimate failure of an elected leader. There is absolutely no reason for his request to be granted. If it is, your very office will have been infected with the Harper contagion. Whether you agree the coalition is reasonable or not isn’t the issue now. Duceppe and the Blocheads aren’t either (the guy made it crystal on TV he will not be part of any government). Whether you think Layton is a leftie fruitloop or Dion is a dweeb, simply doesn’t matter. Our prime minister has turned this into a screaming crisis that now envelops everyone. Does one man – even a prime minister – have the right to shutter the House of Commons? Simply because he won’t get his way? To avoid doing his job? To duck a vote? I think Andrew Coyne said this already, but it bears repeating: Preston Manning united the right, but it took Stephen Harper to unite the left. What a great sound byte.